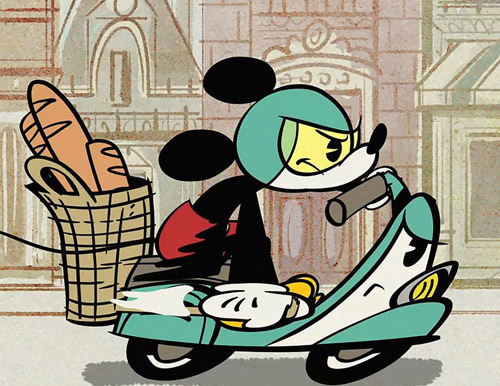 New Mickey Mouse Short with a Scooter! A new series of shorts premiered in June this year on the Disney Channel and one of them is all scooter. It’s called “Croissant de Triomphe” and the heroic scooter makes the most adorable noises I’ve ever heard come out of any bike . . . animated or real. Let’s hope that there are more French Mickey Mouse shorts and scooter toys are not far behind. To check out the background story on the shorts here . And watch “Croissant de Triomphe” here . Spotted in the Vancouver BC (Canada) airport, these are from a collection of Disneyana on display there. No Mickey scooters unfortunately, but hey we’ve got Goofy, Pluto and Donald Duck in the house. To see other Marx toy scooters we’ve featured, click here . Thanks to Shazza for these great pics! Not only is she clearly a mod but she has a pet cat which is a very progressive pet for a mouse to have â€¦ don’t you think? 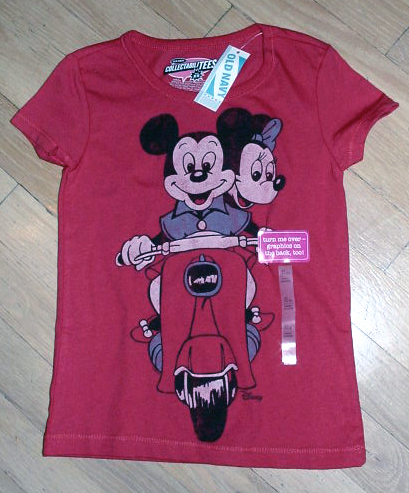 The first photo shows Minnie on a remote control scooter, the second photo shows a jigsaw puzzle with her beau Mickey and the third is Minnie on a smaller scooter toy with lots of accessories and said cat. The RC scooter seems to be only available in Europe while the puzzle falls into the category of “rare swag” as I didn’t find a good online source for it. Try searching “Mickey Mouse Clubhouse Scooter 35pc Jigsaw Puzzle.” The smaller toy scooter is more widely available. 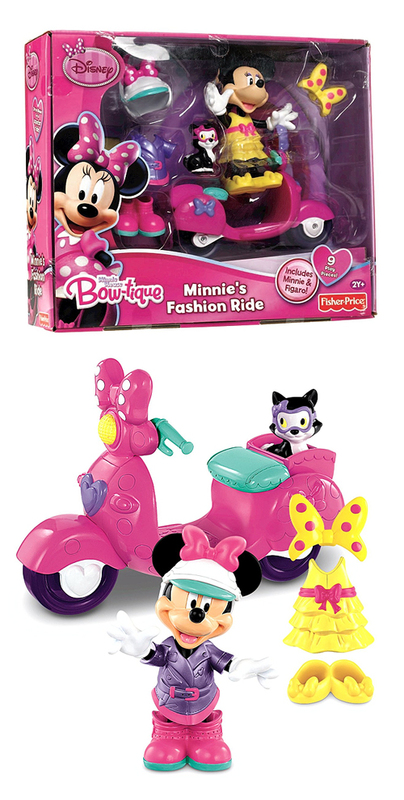 Love the name of Minnie’s line of toys â€” “Bow-tique” ! These looks to be “Aristocats” Disney PJs featuring scenes of Paris, a white cat (Duchess?) and a jaunty green scooter. They were found at a Walmart but I couldn’t find them at Walmart’s site or at Disney’s site. So you’ll have to go shopping! Special thanks to 6-year old Lauren D. for this find. This is almost too cute. She even has a kitty riding cupcake! She’s got a BOW helmet (but of course) and a very stylish riding jacket which I wouldn’t mind owning. The measurements are 2″ X 4.2″ x 2.5″ and the set is $34.80 on Amazon. For Disney fans and scooter fans a must have. Mickey & Minnie Sittin’ In A Tree . . . 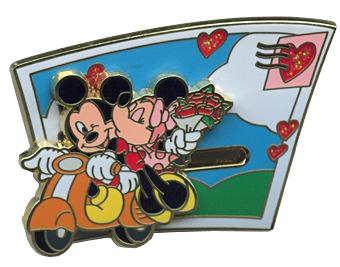 This limited edition pin features Mickey and Minnie on a scooter. The scooter is a “slider element” which can be moved along the front of the background. Pretty cute for $8.95! 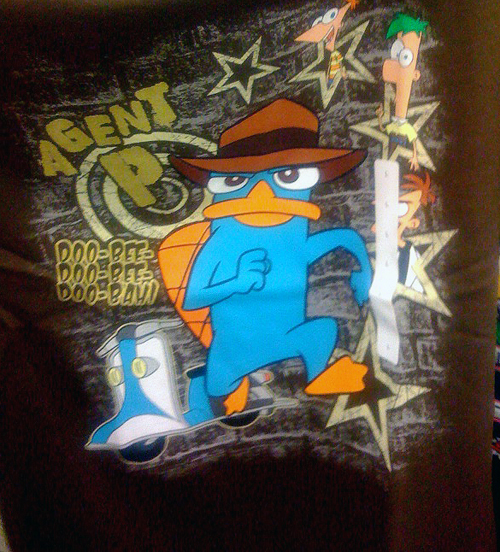 Perry the Platypus is a somewhat mysterious character in the Disney show “Phineas and Ferb.” To disguise himself while he’s riding his scooter to a mission, he dons the ol’ fake nose and glasses. The first shirt is a kid’s shirt available at Target right now on clearance for $5. The next is a woman’s shirt available at Hot Topic for $28 and under. If you’d like to see Perry ride, click on the last link. Thanks to Julie G. for the Hot Topics find and Tom C. for the Target find! Watch Perry Ride His Scooter. 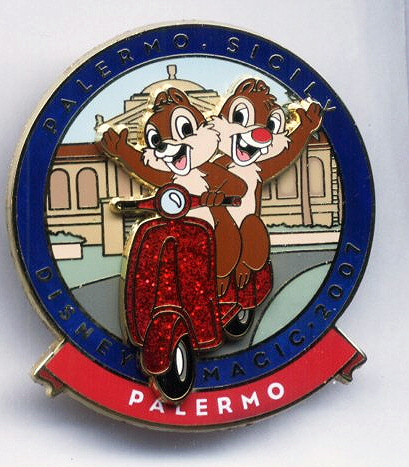 This is a Disney Cruise Line pin featuring Chip ‘n Dale in Palermo, Sicily. It was released on a 2007 Mediterranean Cruise. Thanks to Julie G. for this neato find!